Draft: 2004, Tampa Bay Devil Rays, 3rd rd. Wade Allen Davis … resides in Hudson Valley, N.Y., during the offseason with his wife, Katelyn, daughter, Sully, and son, Ty...He and his wife, Katelyn, are very involved with and support Warriors' Ascent, a program which helps Veterans and First Responders overcome the feelings of isolation, anger and hopelessness through evidence-based healing practices...Attended Lake Wales High School in Lake Wales, Fla., and was committed to the University of Florida before signing with the Rays in 2004...His second cousin is two-time All-Star Jody Davis (1981-88 Cubs; 1988-90 Braves)...The family has two German shepherds, Charlie and Ruth, that travel with them to every city they go to. Led the National League with a franchise-record and career-high 43 saves, surpassing Greg Holland (41, 2017) and Jose Jiménez (41, 2002) ... Recorded his 100th career MLB save June 20, and his 800th strikeout June 19 ... Career-high 49 opportunities, first in NL, second in Majors … save percentage was sixth in the league (87.8) ... Career-high six blown saves … career-high six losses as a reliever ... One run on seven hits with two walks and 25 strikeouts his final 18 appearances (18.0 IP) … had a 10-inning scoreless streak Aug. 12-Sept. 4 ... Earned his third win of the season on Sept. 12 to cap a club-record five perfect innings from the bullpen ... Was 1-4 with four saves in six opportunities and a 15.26 ERA (7.2 IP, 13 ER) July 24-Aug. 9 … was 8-for-8 in save opportunities with an 0.82 ERA (11.0 IP, 1 ER) June 20-July 21 ... Made two appearances in the postseason … pitched 1.1 scoreless innings in the Wild Card Game at Chicago-NL … allowed two solo home runs and walked two batters without recording an out in Game 3 of the NLDS vs. Milwaukee at Coors Field. Was named a National League All-Star in his only season with the Chicago Cubs...Went 4-2 with 32 saves and a 2.30 ERA (58.2 IP, 15 ER), 28 walks and 79 strikeouts...Converted a Cubs franchise-record 32 consecutive saves from the beginning of the season through Sept. 19, the ninth-longest saves streak to begin a season in Major League history … suffered his only blown save of the season and took the loss in the Cubs' extra-inning defeat at Milwaukee on Sept. 23...Struck out 12.12 batters per nine innings, the second-highest rate of his career (highest: 13.63, 2014) and the 10th-highest rate among National League relievers...Limited opponents to a .186 batting average, the seventh-lowest by an NL reliever … recorded a 28.0 soft contact percentage according to Fangraphs, the third-highest rate among all NL relievers...Was selected to the NL All-Star team by the player vote and allowed one run in one inning pitched in the All-Star Game in Miami … went 2-0 with 16 saves and a 1.80 ERA (30.0 IP, 6 ER) in 31 games in the first half of the season...Did not allow a run over his first 15 outings (14.1 IP) and did not allow an earned run over his first 18 outings (17.1 IP) … the 18 outings without an earned run was the longest stretch by a Cubs pitcher to begin a season since Les Lancaster in 1989 (20 outings)...Pitched 1.1 innings on Sept. 15 vs. St. Louis, snapping a streak of 215 consecutive appearances of 1.0 IP or fewer … was the fifth-longest streak in MLB since at least 1913. • Made five postseason appearances, recording four saves in four opportunities with a 4.26 ERA (6.1 IP, 3 ER) … recorded two multi-inning saves, Game 5 of the Division Series at Washington and Game 4 of the League Championship Series vs. Los Angeles-NL. In his final season with the Royals, Wade recorded a career-high 27 saves in 30 chances, despite two 15-day D.L. stints from July 1-16 (right forearm strain) and July 28-September 2 (right flexor strain) ... posted a 1.87 ERA (9 ER/43.1 IP), the sixth-lowest ERA among A.L. relievers (min. 40.0 IP) ... Named to his second-straight A.L. All-Star Team ... Did not allow a home run in 43.1 innings pitched ... his 47.0 consecutive innings streak without allowing a home run dates to September 27, 2015. w Is the third-longest active streak heading into 2017, trailing Zach Britton (63.0 IP) and Kyle Barraclough (60.2 IP) ... Held opponents scoreless in 39 of his 45 outings ... Was named Royals Pitcher of the Month for April, going 1-0 with seven saves in 8.2 shutout innings for the month ... batters hit .077 against him (2-for- 26) ... His blown save, May 15 vs. Atlanta, snapped an 11.2 inning scoreless streak to begin the season and snapped a stretch of a career-high 16-straight successful save conversions ... Royals were 39-6 (.867) in the 45 games he appeared ... in five of those six Royals losses, he entered with the team already trailing ... Pitched three-straight days, June 11-13 - all Royals wins - recording a pair of saves ... was the seventh time he pitched three-straight days and first since June 7-9, 2015 (also did five times in 2014) ... Suffered lone loss, September 2 vs. Detroit, in his first game back from his second D.L. stint ... snapped a stretch of 81-straight appearances without a loss, tied for the fifth-longest such streak in Royals history. Had an outstanding year, being named to his first All-Star team…he pitched a scoreless eighth inning, recording a pair of strikeouts in the Midsummer Classic in Cincinnati...Tabbed the Royals' Bruce Rice Pitcher of the Year for the second straight season by the Kansas City Chapter of the BBWAA...he was the sixth to win the award in consecutive seasons...Served as both a setup man and as the closer due to injuries to Greg Holland…posted an 8-1 record with a career-high 17 saves in 18 opportunities…his eight victories tied for the most among Major League relief pitchers...Since the start of the 2014 season, Davis' 17 victories out of the bullpen are the most in the Major Leagues...Led all Major League relievers with a 0.94 ERA (7 ER in 67.1 IP), the lowest in Royals history by a reliever, topping his own mark from last season (1.00)…he also led all relief pitchers in opponents' batting average (.144) and was second in WHIP (0.79), trailing only Dodgers' closer Kenley Jansen (0.78)...Did not allow a run over his first 22 appearances (April 6-May 31), while he posted a 0.46 ERA (2 ER in 39.0 IP) before the All-Star break…his ERA before the break was the lowest since Brendan Donnelly posted an 0.38 ERA (minimum 35.0) in the first half in 2003...Gave up just one earned run (and one unearned run) in 36 road appearances…opponents batted .089 (11-for-112) in their own ballparks against him...Struck out the side twice, April 10 in the ninth at Angel Stadium and May 29 in the eighth at Wrigley Field...Held left-handed hitters to a .146 average (19-for-130), the fifth-lowest in the Majors among pitchers that faced at least 100 lefties in 2015...Named the Royals Pitcher of the Month in April and July...went 2-0 with four saves in Greg Holland's absence in April and was 4-0 with a 0.84 ERA (1 ER in 10.2 IP) during the month of July...Had a club record 125.2 innings streak without allowing a home run snapped on August 1 in Toronto, when Jose Bautista took him deep…it was the first home run he had allowed since August 23, 2013, the date of his last start...Surrendered two runs to the Angels on August 13, marking just the second time he's allowed multiple runs in 147 relief appearances with KC…the only other time was on April 5, 2014 vs. the White Sox, spanning 114 appearances…it was the second-longest streak of its type in Major League history, behind only Mike Myers, who went 126 appearances (1999-2001) between outings where he allowed two runs or more. Wade completed one of the best seasons by a reliever in club history as KC's primary setup man, setting several team records while leading the Royals with 71 appearances...Tabbed the Royals' Bruce Rice Pitcher of the Year by the Kansas City Chapter of the BBWAA…Also named the Royals Pitcher of the Month three times during the season (May, July and August)...Led Major League relievers with a 1.00 ERA, eighth-best all-time by an A.L. 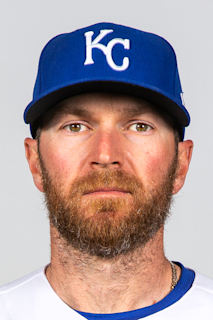 reliever…surpassed Greg Holland's 2013 mark of 1.21 for the lowest by a Royals reliever...Recorded a 0.75 ERA on the road (3 ER in 36.0 IP), best all-time by a Royal (minimum 30.0 innings)...Posted 109 strikeouts, topping the former Royals relief record of 103, shared by Jim York (1971) and Greg Holland (2013)...Finished second among Major League relievers in strikeouts, behind the Yankees' Dellin Betances (135)...Paced the American League with 33 holds, a new Royals record, topping Jason Grimsley's 28 in 2003...Recorded the most wins among A.L. relievers (9)…Became the first Royals reliever to tally nine wins since Ricky Bottalico in 2000...Set a Royals relief record by holding opponents to a .151 average, besting Joakim Soria's .169 in 2008…Ranked second among A.L. relievers to New York's Dellin Betances (.149)...Held opponents to a .179 slugging percentage, lowest among A.L. relievers…Did not allow an extra-base hit over his first 45.2 innings through July 30...Recorded a 31.2 inning scoreless streak from June 27 to September 15, the longest in club history by a reliever...Also posted a 22.1 inning scoreless streak from April 26 to June 23...Saved all three wins on the Royals' September road trip to New York and Detroit, including his first professional save on September 5 at Yankee Stadium...Made 12 postseason appearances, going 2-0 with an 0.63 ERA (1 ER in 14.2 IP)...Recorded 20 strikeouts in the playoffs, which tied with Francisco Rodriguez (2002) and Brad Lidge (2004) for second-most by a reliever in a single postseason...His postseason strikeout total also tied with James Shields for most by a Royals pitcher...Collected wins in Games 1 and 2 of the ALCS vs. Baltimore, becoming the first pitcher to collect victories in consecutive playoff games since Atlanta's Alejandro Pena did it in the 1995 ALDS...Enters 2015 with a career record of 3-0 with a 1.25 ERA (3 ER in 21.2 IP) in 15 career postseason appearances. Wade spent most of his first season with KC as the club's fourth starter before moving to the bullpen in September. Set a career-high with 114 strikeouts in just 135.1 innings...passed his previous career high (113), which he did in 168.0 frames in 2010. Struggled to find consistent success, allowing six earned runs or more in six of his 24 starts ... however, posted a 6-4 record and a 3.38 ERA over his other 18 starts (37 ER in 98.2 IP). Earned a pair of 1-0 wins, first on April 17 at Atlanta (7.0 IP) and again on July 27 at Chicago-AL (7.1 IP). Enjoyed a strong finish out of the bullpen, going 2-1 with an 0.90 ERA (1 ER in 10.0 IP) over seven appearances ... held opponents to an .094 average (3-for-32) out of the 'pen. Made one appearance at Wilmington (A-Advanced) on August 31, allowing no runs on one hit over 2.0 innings with five strikeouts ... it was his first minor league outing since 2009. Wade completed his third full season in the Majors, first in the bullpen for the Rays...went 3-0 with a 2.43 ERA(70.1 IP, 19 ER) in 54 appearances after posting a career 4.22 ERA as a starter from 2009-11...Struckout 11.1 batters per 9 IP and allowed only 6.1 hits per 9 IP...the strikeout ratio was the highest in the AmericanLeague among relievers who compiled at least 70 innings while his hits per 9 IP was the 4th-best...His 87 strikeoutstied for 4th-most among A.L.relievers...struck out the side 10 times,most among A.L.relieversand 2nd most in the Majors behind Atlanta's Craig Kimbrel (17)...Led the Rays with 23 relief appearances of more than 1.0 inning, the fourth-most in the league...AftertheAll-Star break, 22 of his 25 outings were scoreless...compiled a 1.50 ERA(30.0 IP, 5 ER)in the secondhalf and did not allow a home run...over his final 11 outings beginning September 5, collected 24 strikeouts in12.1 IP...Held left-handed battersto a .161 (18-for-112) average, the second-bestmark in theA.L. behind Oakland's GrantBalfour (.157). Went 11-10 with a 4.45 ERA in 29 starts, throwing a career-high 184 innings despite a brief stint on the disabled list with a right forearm strain...His ERA was more than two runs lower at home than on the road...went 6-4 with a 3.48 ERA (101-IP, 39-ER) in 15 home starts...was 5-6 with a 5.64 ERA (83-IP, 52-ER) in 14 starts away from Tropicana Field, despite receiving the AL's 8th-highest run support on the road...received 3.56 R/9 IP (101-IP, 40-RS) in run support at home compared to 6.72 R/9 IP (83-IP, 62-RS) on the road...After the All-Star break went 3-0 with a 2.85 ERA (53.2-IP, 17-ER) in 7 starts at Tropicana Field, with the Rays winning each of those games...in 6 road starts after the break he went 1-4 with a 7.96 ERA (31.2-IP, 50-H, 28-ER)...Averaged only 5.14 SO/9 IP, 6th-lowest rate in the AL...in 18 starts through July 22, averaged 4.13 SO/9 IP (109-IP, 50-SO)...after that, however, averaged 6.60 SO/9 IP (75-IP, 55-SO) over his last 11 starts...His 46.7 groundball pct. was 5th lowest in the AL...Yielded 12.77 base runners per 9 innings, highest on the staff and 7th highest in the AL...Opponents stole only 2 bases in 6 SB attempts (33.3 percent)-tied for the 2nd lowest success rate in the majors...only CWS Mark Buehrle (3-for-10, 30 percent) was better...On Sep 9 vs. BOS threw his lone complete game of the season and second of his career, defeating John Lackey, 7-2, for his 10th win...also tossed 9 innings on Aug 24 vs. DET but received no decision in the 10-inning, 3-2 win...Was placed on the DL with a right forearm strain on July 7...returned on July 22, after missing only 1 start because of the All-Star break...On March 31 agreed to a seven-year contract with the Rays, with the first four years (and $12.6 million) guaranteed...the Rays hold three one-year options for 2015, 2016 and 2017, with a maximum value of $35.1 million if the options are exercised...he will donate a portion of his contract to the Rays Baseball Foundation....POSTSEASON: Made 2 relief apps in the ALDS vs. Texas, pitching out of the bullpen for the first time of his professional career...in Game 1 retired the side in order in the 9th inning...in Game 4 recorded 1.1 scoreless frames. Led American League rookies with 12 wins,one behind STL Jaime Garcia for the majorleague rookie lead ... also led AL rookies inERA (4.07, tied SEA David Pauley) and ranked2nd in innings pitched, strikeouts and gamesstarted behind BAL Brian Matusz. ... Was chosen as the team's Outstanding Rookieby the Tampa Bay Chapter of the BaseballWriters' Association of America. ... Was named AL Rookie of the Month for Julyafter going 4-0 in 5 starts with a 3.03 ERA (32-IP, 11-ER) ... was the first Rays pitcher to win aRookie of the Month award, fourth differentRay to win it and the fifth monthly award for theRays' previous winners were Evan Longoria(June 2008), Damon Hollins (May 2005) andRocco Baldelli (April, May 2003). ... Went 3-1 with a 2.79 ERA over his first 5 starts(through May 2) ... went 2-8 with a 5.90 ERAover his middle 11 starts (May 8.July 3) ... coverhis last 13 starts (July 8 on) went 6-1 with a3.22 ERA, with the Rays winning 10 of thosegames. ... Faced the opposing team's Opening Daystarter (all former All-Stars) in each of hisfirst 6 starts, and the Rays won four of thosegames ... he went 3-2 with a 3.18 ERA (34-IP,12-ER) with wins over Mark Buehrle (April 21at CWS), Ben Sheets (April 27 vs. OAK) andZack Greinke (May 2 vs. KC) ... on May 2, beatGreinke 1-0 with 7 shutout innings, allowingjust 3 hits. ... Compiled a 7-game winning streak, July 8.Sep 11, tied with MIL John Axford for the longestby a rookie in the majors in 2010 ... thestreak tied for the longest in club history withJeff Niemann (2008-09) and Mark Hendrickson(2005), and was the longest ever by a Raysrookie ... compiled a 3.34 ERA (59.1-IP, 22-ER)over this stretch of 9 starts, after his lossJune 27 vs. ARI, did not lose again until Sep 27vs. BAL, a stretch of 12 unbeaten starts. ... Went 0-5 with a 6.00 ERA (27-IP, 18-ER) in themonth of June, losing all 5 of his starts. ... On Aug 10, was placed on the 15-day disabledlist with a right shoulder strain, retroactive toAug 6 ... Jeremy Hellickson was recalled toreplace him on the roster ... was reinstated onAug 24 ... beat the Angels, 10-3, at Angel Stadiumthat night for his 10th win of the season ... went 3-1 with a 3.09 ERA (46.2-IP, 16-ER) over8 starts after returning from the DL. ... Entered 2010 ranked by Baseball America asthe No. 3 prospect in the Rays org. behindDesmond Jennings and Jeremy Hellickson. Lake Wales, Fla., native was promoted fromTriple-A Durham on Sep 4, made his majorleague debut two days later and made 6 startsfor the Rays over the season's final month...prior to that made 28 starts for Durham....Went 2-2 with a 3.72 ERA for the Rays, withboth victories coming over Baltimore...wasone of three rookies in the Rays rotation inSeptember, joining Jeff Niemann and DavidPrice....Enters 2010 ranked by Baseball America asthe No. 3 prospect in the Rays organization,and the No. 34 prospect in all of baseball....Made his debut Sep 6 vs. DET, one day beforehis 24th birthday...got a no-decision in a 5-3Rays loss, totaling 7 IP, 3 H, 1 R/ER, 1 BB, 9SO, 105 pitches...his 9 SO set a club recordfor a ML debut...left with a 3-1 lead and was2 outs from victory when Brandon Inge hit agrand slam off Russ Springer...first hit allowedwas Aubrey Huff's 2nd-inning HR....The 9 SO tied for the 5th most by a pitchermaking his debut in the last 30 years...fannedhis first 4 batters faced, recorded his first6 outs via the strikeout and retired 13 of hisfirst 14 BF...since 1963, only one other playerstruck out his first 4 BF in his ML debut - TEXNeftali Feliz did it one month prior to Davis, onAug 3, 2009 at OAK....On Sep 17 at BAL, his third start, he tossed acomplete-game, 4-hit shutout to earn his firstmajor league win (2-BB, 10-SO, 124 pitches)...was the first pitcher to throw a 9-inning CGSHO in his 3rd ML game (or quicker) sinceBOS Clay Buchholz's no-hitter on Sep 1, 2007vs. BAL (2nd career game)...124 pitches werethe most by a Ray under Joe Maddon....Became the first pitcher to record his first MLwin via a CG SHO (9+ IP) since LAA Ervin Santana,May 23, 2005 vs. CWS...was 2nd Rayto do it, joining Travis Harper (Sep 24, 2000 atTOR)...became the first pitcher in 17 years tothrow a CG SHO with 10+ SO in his first MLwin...last was CAL Tim Fortugno on July 25,1992 vs. DET....On Sep 12 at BOS, totaled 2.2 IP, 6 H, 8 R/ERafter rain delayed the game by more thantwo hours...excluding that start, he pitchedto a 1.87 ERA (33.2-IP, 7-ER) over his other5 outings....Went 1-1 with a 2.55 ERA at Tropicana Field,compared to 1-1, 6.17 on the road....Had more SO than IP in 4 of 6 starts...allowed1 ER or less in 3 of 6 starts and 2 ER or less in 4of 6 starts...worked 7-plus innings 3 times.In 34 combined starts ... for the Rays and Durham,he went 12-10 with a 3.46 ERA (195-IP,172-H, 90-R, 75-ER, 73-BB, 176-SO)...setcareer highs in starts, innings pitched andstrikeouts....Led the International League in inningspitched...ranked among IL leaders in strikeouts(2nd) and ERA (7th)...among all Triple-Apitchers, ranked 2nd in strikeouts and 3rd inopp avg....On Aug 18 in Durham, beat CWS Jake Peavy(rehabbing for Charlotte) to earn his 10th win....Was ranked by BA as the No. 32 prospect inthe game entering 2009, and moved up toNo. 16 on their midseason list. Began the 2008 season with Double-A Montgomeryand earned a promotion to Durhamat the All-Star break...combined for a 13-8record with a 3.47 ERA in 28 starts (160.2-IP,143-H, 62-ER, 66-BB, 136-SO)...despite theJuly 16 promotion, was named Montgomery'sPitcher of the Year....Was named the Rays No. 3 prospect after theseason by BA, trailing only David Price andTim Beckham...BA also rated his curveballas the best in the organization for the secondconsecutive year....Started the Southern League All-Star Gameon July 14 and suffered the loss...was one ofsix Biscuits selected to the South squad...is afour-time All-Star in the minor leagues. Selected Rays Pitcher of the Year by the team's baseball operations department while going a combined 10-3 (ERA-2.50, IP-158.1, H-128, ER-44, BB-51, SO-169) in 27 starts at A Vero Beach and AA Montgomery...His 169 strikeouts were 2nd in the organization and 7th overall in the minor leagues...Lost just 3 games in 27 starts and was undefeated (7-0) in his first 20 starts...didn't lose until July 28 when he fell 2-0 to Birmingham (White Sox) despite taking a 2-hit shutout into the 7th inning...Allowed 3 ER or less in 25 of his 27 starts and one ER or less 17 times...won only 3 games at Vero Beach despite allowing 3 ER or less in all 13 starts and one ER or less 10 times...16 times he had more Ks than hits allowed...Hurled his second career no-hitter on May 4 for Vero Beach, striking out 6 in the 7-inning victory over host Jupiter (Marlins)...only two runners reached base (error and a walk)...it was the 2nd no-hitter of his pro career...also threw one in his last start of 2006 for Class-A SW Michigan...owns two of the six complete-game no-hitters in the history of the organization...Also set a career high with 13 strikeouts against Jupiter in his final start for Vero Beach...allowed just 2 hits and one ER in 6.2 innings while striking out 13 of the 24 batters he faced. Was 2nd in Midwest League and the Rays organization in 2006 in strikeouts to teammate Jake McGee with 165...Tossed a complete-game, 7-inning no-hitter on August 31 against Beloit, but still lost as a pair of errors (including one by himself) allowed a run to score in a 1-0 game...Posted a 0.67 ERA in April and was named Rays Minor League Pitcher of the Month...followed that with a 1.32 ERA in May and a 1.55 ERA in August...ranked 7th-best prospect in the organization and 8th-best prospect from the MWL by Baseball America. Named Hudson Valley's Pitcher of the Year in 2005...led the Renegades staff with a 2.72 ERA which was 7th best in the New York-Penn League and 2nd lowest among Rays minor leaguers...his seven wins led the team and ranked 2nd in the NYPL...Also led the league with 97 strikeouts, which was the highest total by a Renegadespitcher since Joe Kennedy fanned 101 in 1999...Selected as a New York-Penn League All-Star...tabbed the 6th-best Rays prospect and the 3rd-best prospect in the NYPL by Baseball America. Led the Princeton Rays in 2004 with 13 starts and 57.2 innings, but also finished among Appalachian League leaders in runs allowed (3rd), home runs (2nd) and hits allowed (5th). December 29, 2017 Colorado Rockies signed free agent RHP Wade Davis. November 2, 2017 RHP Wade Davis elected free agency. June 6, 2017 Chicago Cubs activated RHP Wade Davis from the paternity list. June 5, 2017 Chicago Cubs placed RHP Wade Davis on the paternity list. December 7, 2016 Chicago Cubs traded LF Jorge Soler to Kansas City Royals for RHP Wade Davis. September 2, 2016 Kansas City Royals activated RHP Wade Davis from the 15-day disabled list. August 27, 2016 Kansas City Royals sent RHP Wade Davis on a rehab assignment to Omaha Storm Chasers. August 24, 2016 Kansas City Royals sent RHP Wade Davis on a rehab assignment to AZL Royals. July 31, 2016 Kansas City Royals placed RHP Wade Davis on the 15-day disabled list retroactive to July 27, 2016. Right flexor strain. July 16, 2016 Kansas City Royals activated RHP Wade Davis from the 15-day disabled list. July 5, 2016 Kansas City Royals placed RHP Wade Davis on the 15-day disabled list retroactive to July 1, 2016. Right forearm strain. September 3, 2013 Kansas City Royals recalled RHP Wade Davis from Wilmington Blue Rocks. August 28, 2013 Kansas City Royals optioned Wade Davis to Wilmington Blue Rocks. August 11, 2013 Wade Davis roster status changed by Kansas City Royals. August 4, 2013 RHP Wade Davis roster status changed by Kansas City Royals. July 14, 2013 Kansas City Royals activated RHP Wade Davis from the paternity list. July 11, 2013 Kansas City Royals placed RHP Wade Davis on the paternity list. July 22, 2011 Wade Davis roster status changed by Tampa Bay Rays. July 7, 2011 Tampa Bay Rays placed RHP Wade Davis on the 15-day disabled list. Right forearm strain. August 24, 2010 Tampa Bay Rays activated RHP Wade Davis from the 15-day disabled list. August 10, 2010 Tampa Bay Rays placed RHP Wade Davis on the 15-day disabled list retroactive to August 6, 2010. Strained right shoulder. September 2, 2009 Tampa Bay Rays recalled RHP Wade Davis from Durham Bulls.